Lets get this out of the way first -Bill Belichick and the Patriots broke the rules. There is no disputing that. They were punished for it. Yes, I’m trying to put this all behind me, but I think it’s important to review just how disgraceful the behaviour of national media was during this whole episode, and attempt to put as much of it on the record as I can here. The myopic media have chosen to focus solely on the sensationalistic aspects of this case, right from the beginning. Whether or not this was really a major rules violation that garnered a significant advantage is not the point. THE NEW ENGLAND PATRIOTS CHEATED AND ALL THEIR CHAMPIONSHIPS ARE NOW TAINTED. That’s the message that has been sent out, and that which has been pounded repeatedly into the conscious of the American public. The implication has been that the taping of signals is the golden lamp which when rubbed, automatically ensures victory. They insist that the advantage gained by these tapes is the single most important factor (even if some faint voices say otherwise) in the Patriots success this decade. Never mind that the stealing of signals has been going on in all sports almost from the beginning. Never mind that other teams have been caught doing the same or worse. Ignore all of that. Taping from the sidelines during games, although forbidden, is regarded as a minor violation of the rules. Yeah, the same guy now advocating a lifetime ban of Belichick. Nothing has changed since that day, in fact, the Patriots position has improved, as the notion of the walkthrough video has been dismissed. The Boston Heraldand John Tomase have apologized for putting out this false information. Yet now Easterbrook wants the lifetime ban? They’ve also shown that just because something has already been reported, it doesn’t mean you can’t write it again and shout from the rooftops that there is a new angle. One of the prominent figures of this whole saga has been ESPN “investigative reporter” Mike Fish. For someone billed as an investigative reporter, I haven’t seen this guy yet bring something of value to the table. You’d think an investigative reporter would…you know…investigate. He would look into all aspects of a story, uncover new facts, perhaps expand the scope of the story to include other teams and their practices, to see if what the Patriots did was really out of line with what other teams were doing to get an edge. Nope. He’s been solely focused on the Patriots. He hands in pieces like this, which have absolutely no new information whatsoever. I’m tempted to dub him Mike Fishwrap, but that would be an insult to paper that is actually used to wrap dead fish. This will somehow get blamed on the internet, I’m sure, but this whole episode has consisted of events where reporters and media have shot first and asked questions later. The rush to be first get the news out there and garner attention has overidden everything else, including journalistic standards. Tomasegate is the prime example, but there are others. Remember in the last few weeks when there was a big rush of OFFENSIVE SIGNALS headlines(That Fish guy again) after Walsh turned over his tapes? Some speculated that this was a new facet of the cheating that could open up the case even more and end up in that eagerly anticipated suspension for Belichick. Patriots coach Bill Belichick could be hit with more sanctions in connection with the team’s past videotaping activities. “This is consistent with what the Patriots had admitted they had been doing, consistent with what we already knew,” NFL spokesman Greg Aiello told The Associated Press. That statement didn’t stop the media from running with the OFFENSIVE SIGNALS storyline. That went on for a few days before dying out when people finally realized that the offensive signals weren’t really of any use. videotaping “will be irrelevant. Now the offense will have no way of stealing signals anymore, because they’ll be done the same way the offense sends in signals — from the coach to a player on the field [through a microphone and speaker]. What that quote is saying is that taping offensive signals in the past was irrelevant – because there are no hand signals to steal. So besides the fact that the tape were consistent with what the NFL already knew, it’s also come out that the taping of offensive signals was pretty much of no value. For all we know, Walsh may have had more information and more damning evidence of the Patriots and their use of the infamous practice and signal tapes, but money has a way of making everything better. Again, no one, but Walsh and a few people with the New England franchise, will ever know the truth. If the Patriots paid Walsh to destroy the tape, couldn’t they just have slipped him a few more bucks just to shut up all together? These types of unsubstantiated claims and assertions have been just far too common during this whole time. Here’s one more example, from just last night. DID PATS TAPE RAMS’ SIGNALS DURING 2001 SEASON? One issue that has been overlooked by many/most/all of the media, and of which a reader has reminded us recently, is the question of whether the Patriots used their videotaping system on the St. Louis Rams when the two teams met in the 2001 regular season, only a couple of months before Super Bowl XXXVI. Even though we now know that the Pats didn’t videotape the Rams’ walk-through prior to the game, it doesn’t mean that there was no cheating on the biggest stage in sports. It’s unclear whether the question has been asked, but it sure doesn’t appear to us that the question has been answered. And it’s a simple question — did the videotaping of defensive coaching signals include the November 18 prime-time game between the two teams, which the Rams won, 24-17? Q. The regular-season game against the Rams in 2001, what were your duties? A. I remember before the game, our video room was located right next to the visitor’s locker room. Even though the locker room doors were closed, myself and Pepper Johnson were outside the video room right before the game. And we were able to hear, through the doors, Mike Martz giving his pre-game speech to the team. Trying to incite them about, you know, it was Sunday night football. How good they were. And how we were just another A.F.C. team. They won by a touchdown, so I guess it worked. Q. And what did you do during the game? A. Filmed, to the best of my recollection. I can’t specifically say I remember the details of what I filmed. Conveniently, Walsh doesn’t “remember the details.” He seems to remember everything else about that season, including meaningless preseason games, but he doesn’t remember this game and what he was doing. (Though he remembers the pregame incident from that same game.) If he DID film that game, don’t you think he would’ve said so directly, rather than vaguely dodging the question by saying he must’ve filmed, but doesn’t remember the details? That tells me he didn’t film it. In fact, if he did, don’t you think that would’ve been one of the tapes he would’ve taken before he left the organization, given the significance of that game later on down the line? This tells me two things…one, Florio truly was just “throwing it out there” – shooting before aiming, a problem throughout this entire episode – and two, the more you look into it, how much of anything Walsh says can you really believe? That hasn’t stopped the media from breathlessly taking his words and running with them. They’ve behaved with the subtlty of a pack of screaming jackals. You can’t turn around these days without someone howling about the integrity of the game, about tainted championships, about lifetime suspensions. They’ll howl at whatever camera, microphone or keyboard is in front of them. Attempts to reason with them go about as well as a carcass trying to talk its way out of getting torn to shreds by the pack. These are the same ones who were (and are) screaming about “running up the score” and “sportsmanship” and even Belichick’s postgame handshakes. Greg Bishop, New York Times – You can detect a clear pattern in his stories. Let’s see, a puff piece on Charley Casserly in April leads to a piece in May with a “longtime N.F.L. team executive.” Think they’re not one and the same? Another puff piece on Michael Levy in March leads to the Times getting the 8 Tapes from Walsh before the NFL did and also an exclusive interview with Matt Walsh. Why in the world would the New York Times write a piece on Drew Bledsoe? (March 10) Well, on February 22nd, Bishop got a “a former Patriots player” to talk about the Patriots taping signals as far back as 2000. Is it too much of a stretch to consider that Bishop wrote the article on Bledsoe’s wine and coffee business ventures as payola for the info in the Feb 22nd article? Mark Schlereth, ESPN – Prior to the Patriots, his Denver Broncos were considered a mini dynasty of their own. Now, relegated to a footnote Schlereth has tried to discredit the Patriots at every turn. He insists that the team used the filmed signals during the same games, something that not only defies logic, (How could the team edit all that raw footage into a usable video AND decipher the signals within the same game?) but that even Walsh has denied. Tomasegate gave new life to the story that should have been put to bed. The same media types who are shaking their heads at John Tomase for his handling of the Rams walkthrough video story were the first ones to gleefully run with his story when it came out. The walkthrough video story dominated ESPN’s Bottom Line and NFL Network’s ticker as well. Columnists and reporters around the country lined up for a second shot at the team and coach, and this has continued for three and a half months. Had Tomase not published his story, perhaps this thing would be a dead issue by now. Instead, the witch-hunt has intensified, and even though the Tomase story has been retracted and an apology issued, the Spygate hysterics are back in full swing. Tomase’s story is the single most egregious part of this entire matter, and he has skated, scot-free. As Patriots Daily pointed out today, Tomase may be accountable for his actions, but he hasn’t yet been held to account. Rather than doing their jobs the way they’ve been trained, the media have taken as gospel the words of someone whose only true value was fueling the fire. To the media, everything is all about “advancing the story” – Walsh and Tomase were supposedly doing this, yet we see after the fact that they didn’t have anything new to offer. Even though they’ll dismiss this notion out of hand, this whole episode boils down to access. Can you sit there and realistically say that had it been Tony Dungy, Jon Gruden or Herman Edwards that did this that the stories and commentary would be as nasty and personal? If Bill Belichick sat down with the likes of Peter King on a weekly basis and invited them to watch him mow his lawn like Brett Favre, how do you think this would’ve gone? You can almost hear the excuses that would’ve been made had these ones offered the same explanations that Belichick has offered. With Belichick, it’s because he is a cheater. All because he doesn’t “play the game” of keeping the media happy and well supplied with snappy quotes. The actual accomplishments of the players and team are now dismissed. Regardless of perceived advantage that the filmed signals would’ve provided, the players on the field had to make plays in order for the Patriots to win their championships. They had to make key stops, they had to catch the ball, run through the hole, or knock the offensive lineman aside to get to the quarterback. Nothing gained through film work could possibly help the players on the field do these things. Knowing the defensive signals didn’t help Ty Law pick off Peyton Manning in the playoffs. It didn’t help Rodney Harrison seal the Super Bowl against Specter’s Eagles with a pick. This is perhaps the saddest aspect of the whole affair. The accomplishments of such talented players have been muddied because of how the scandal has been blown out of proportion. Sure, Belichick and the Patriots do deserve a share of the blame because they broke the rules and started this whole mess, but the media has taken this event and taken it entirely too far. At some point, another big scandal will erupt in the world of sports. The sports media’s attention will shift to that, leaving this episode in the past, to be revisited whenever convenient. (Especially if the Patriots roar out of the gate next season, or perhaps even more so, if they struggle.) To be sure, this isn’t going away completely, but it will fade into the background somewhat, but the damage will be permanently done in its wake. It all added up to the The Most Miserable 18-1 Season in History but it clearly hasn’t stopped there. The amount of coverage given this scandal has been nothing short of overwhelming. The average fan trying to follow this story could find himself hopelessly lost in the shouting, conjecture and speculation. Unfortuately, responsible reporting has not prevailed at all in this case, and reason is a rare commodity among this crowd. Keep in mind that most of these same reporters and outlets were silent during the whole steroid era in baseball – even though most of them had a pretty good idea of what was going on. Is the outcry over this story merely these same ones overcompensating for their silence on steroids? Or is it part of our society’s macabre habit of turning on and tearing down our heroes after we’ve built them up? Whatever the reason, the stench from all of this mess is going to take a long time to wear off. I’ve been trying to make this argument for months. You trumped me big-time. Belichick did apologize at the NFL Owner’s meetings this past winter. And so did the Kraft’s. In fact, it was reported that both of them were warmly applauded. Was he supposed to apologize to the media; the same people who were already trying to turn him into a modern day Hitler-type figure simply because he didn’t shake Eric Mangini’s hand long enough after the 2nd Jets’ game in 2006? 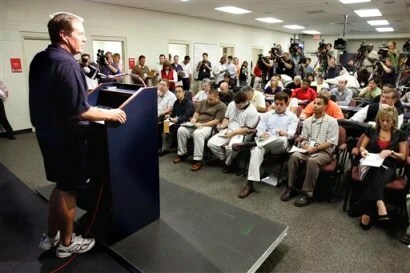 The same media who REPEATEDLY printed the lie that Belichick “snubbed” Peyton Manning on the field of the RCA Dome after the 2006 AFC title game, despite the fact that there is a picture available that shows Belichick, as plain as day, shaking Manning’s hand and congratulating him on the field as the blue and white “Colts” confetti reigns down from above. Don’t ever, EVER forget that the media hated Belichick and was engaged in the process of smearing him as much as possible LONG before Spygate ever broke. You mean the handshake where BB barely even made eye contact with Peyton? Bwahahahahaha. Sorry, not impressed. Regarding the meetings in Palm Beach, by most accounts – Kraft was the one who received applause. BB continued to give everyone the same line of BS. The guy is a liar and a cheat is being portrayed as such. He has nobody to blame but himself. Perhaps if his reputation had been a little better leading up to this, the media wouldn’t have been so tough on him. However assaulting camera men, reneging on contracts, and being involved with married women aren’t really the acts of a quality individual. Tom, it sounds to me like you’re repeating a lot of stuff that you’ve HEARD about Belichick through the media….again, buyer beware. What contracts has he “reneged” on? There’s no such thing as a guaranteed contract in the NFL and therefore they cannot be reneged on. Your argument is a non-sequiter. And really, so now the problem is that the handshake with Manning wasn’t good enough? Before, the media were flat out telling us that he SNUBBED him and didn’t even congratulate him after the game. That was a LIE. Just because a guy doesn’t make your job easier to do does not give you license to betray your professional obligations and spread falsehoods about him. Trust me dude, I have a media background (I got out before they got their corrupt hooks into me too deep). I know what these people are and how they think. But to just go off and call the guy a liar and a cheat because he said “misinterpreted” is a huge stretch. By all public accounts, Belichick cooperated fully with all NFL investigations into this matter, and he told the truth about not using the tapes during the games, AND it’s been confirmed that he was telling the truth about not taping the Rams’walkthrough. If you want to pin your “he’s a liar” statement on his use of the word “misinterpreted”, then go for it. But the fact remains that BB has lied one hell of a lot less than the media has during this entire affair. The media lies and distorts to further their own agendas. They do it all the time. It’s the modus operandi for far too many of them. You’re way off base on this one…but I suspect that your screen name is a smokescreen, and that you’re probably a non-Patriots fan who has merely come here to stir the pot a little bit. Nice try, but you’re simply dead wrong. I’m talking about his own contract with the Jets…or am I going back too far for you? I know most Pats fans don’t remember much pre-2001 but it wasn’t THAT long ago. I’m aware that coaches walk out on contracts all the time, and I don’t blame him for walking out on that miserable franchise, but he clearly could have handled the situation with more class and respect to the Jets. Also, if what Walsh said was accurate about him being instructed to come up with cover stories for what he was filming…then it is NOT a stretch to call BB a liar for saying “misinterpreted” the rule. Saying he told the truth about not using the tapes during the games doesn’t do much for me considering that was his excuse for breaking the rule in the first place…lol. There have been plenty of coaches in many sports that were less than forthcoming with the media…so we’re not breaking any new ground in that area. If you’re constantly wondering why BB consistently never gets the benefit of the doubt when he’s involved in certain situations, ask yourself if he deserves it based on his track record of being a man of less than ideal integrity both on and off the field. I certainly remember the situation with the Jets…you were not specific when you said “reneging on contracts” in your previous post, so I assumed that you were referring to cutting players that were under non-guaranteed contracts. As for that situation, he resigned as Jets’ coach, so if you want to call that reneging on a contract, that’s fine. But he did legally resign the job, and then the Pats had to fork over a #1 pick to the Jets in order to have the right to negotiate with him. So that situation, no matter how you slice it, was handled in a strictly legal manner. As for your “pre-2001” crack, I’ll have you know that I attended my first Patriots game in 1975. As for Walsh…do you think he was telling the truth that he was concealing his videotaping practices in light of the video tapes showing him running his video camera in full Patriots’ gear? How about Matt Estrella, who was on the Pats’ sideline in his bright red Pats’ shirt and kaki pants, pointing his video camera at the Jets’ sidelines in full view of 70,000 people. Saying he told the truth about not using the tapes during the game may not do much for you, but it’s still the truth. I don’t constantly wonder why BB consistently never gets the benefit of the doubt from the press. I know exactly why he doesn’t. He’s a jerk to them…but even worse, he’s an UNENTERTAINING jerk. Parcells treated them like vermin, so did Jimmy Johnson, but those guys also gave them “money” quotes that they could use for great soundbites on the TV news or use as headlines in the paper the next day. Belichick is not only guilty of being jerks to the press, but he’s guilty of the worst sin of all….not giving them any funny or cool quotes to use. Outstanding Bruce. Once again you’ve outdone the msm at their own game. I certainly don’t blame fans of other teams for being pissed at BB about it. We all hated Al Davis, too. And we don’t like Bonds or McGwire or Clemens any more. People feel lied to, and nobody likes being lied to. But a lot of perspective has been lost. It’s like getting 3 years in jail for stealing a weedwhacker, albeit a top of the line weedwhacker, and then having to listen to people talk about you like you shot your neighbors’ dogs. I sure as hell didn’t hear this much of an uproar when we learned that oil company executives helped determine Bush’s energy policy, not even now when we’re paying $4/gallon for gas. Fantastic job of capturing how Patriots fans feel about this ridiculous hatchet job on Belichick and the Pats, largely because they are so damn good that people feel a reason to explain it in a way that doesn’t involve a lot of hard work, a great system and players and staff that bleed football from every pore. Great article Bruce. I definitely and respectfully disagree with a lot of it and do think Belichick brought this on to himself (should have just admitted things in September and most of this would have gone away right then), but you made many, many excellent points. It is just amazing how the football gods work; Belichick gets caught cheating on a NY team, NE gets upset about the feedback from the whole situation and runs the table in the regular season almost in spite of everyone chastising them, and then it goes right back to a NY team and the NY team wins it all. Some strange irony there, no way any one predicted the NY Giants would win the Super Bowl at the beginning of the season! Keep up the great work Bruce!!! good grief, Dan…..are you serious?…have you been following this story at all? Pats fans. Be very thankful. The media has played into our hands once again. The Pats will be great again this year in a large part because of the built in motivation. The media has exposed themselves this year as habitual liars. The best lies mix in a bit of the truth to make it easier to swallow. They are running out of the truth condiment. Don’t defend the Patriots, they were penalized, heavily. Attack the media. Make them accountable, if necessary boycott them and just watch the games. Who needs all that commentary anyway? Its not like most of them really understand football anyway, yes even former players. The Patriots are fun to watch because they play the game of football so well. Bruce, check out Mike Florio’s post about Matt Walsh not taping the first Rams game. Seems like alot of that Greg Bishop info is very similar to your comments. Did you guys communicate about that? Bill Belichick and the Patriots broke the rules. There is no disputing that. They were punished for it. The question, however, is whether the severity of the punishment was equal to the benefit gained by cheating. How many teams wouldn’t give up a 1st round pick and $750K in fines for three SB titles? And why would Belichick risk getting caught at cheating unless he thought he needed that extra edge? Strawman. I have yet to see anyone make anywhere close to such exaggerated assumptions. Automatically? No, only that it helps a great deal. Most important? No, but significant. Never mind that the stealing of signals has been going on in all sports almost from the beginning. Which ignores a significant detail: the Patriots were caught VIDEOTAPING (and not just “stealing”) signals. Nothing has changed since that day, in fact, the Patriots position has improved, as the notion of the walkthrough video has been dismissed. While the last part of the sentence about the walkthrough is accurate, the rest is not, as it is now clear that Goodell greatly understated the duration and importance of the cheating during his SB presser. On the contrary, you’re confusing the verb tenses between present/future (“are” and “will be”) and past (“was”). Thus the quote stating that the new system will make hand signals irrelevant implies they were relevant before thereby contradicting your assertion. More ad hominem. Attempting to discredit the sources does nothing to refute what they claim. Otherwise, I could simply refute this entire article by stating that you haven’t even bothered to hide yours. Is it too much of a stretch to consider that Bishop wrote the article on Bledsoe’s wine and coffee business ventures as payola for the info in the Feb 22nd article? A peculiar statement from someone who decries “sensationalism, exaggeration, rush to judgement and opinion”. “Another prime example of ‘Let’s throw something out there without making any effort to check into it at all’” sound familiar? Schlereth has convienently not addressed the fact that the Broncos circumvented the salary cap so they could pay John Elway and Terrell Davis $29 million in deferred payments. Tu toque argument. That the Broncos cheated has no bearing on whether the Patriots cheated. Why? Because the Broncos did it instead of the Patriots? Tomase’s story is the single most egregious part of this entire matter, and he has skated, scot-free. I agree that he deserves more than a slap on the wrist for writing an unsubstantiated story, but then again, so does Belichick for cheating. Poisoning the well. Besides, it couldn’t have anything to do with Belichick cheating and basically getting away with it, could it? Can you sit there and realistically say that had it been Tony Dungy, Jon Gruden or Herman Edwards that did this that the stories and commentary would be as nasty and personal? Regardless of perceived advantage that the filmed signals would’ve provided, the players on the field had to make plays in order for the Patriots to win their championships. Yet cheating makes it easier for them to be in the right position to make those plays. If you disagree, then I suggest a little experiment: why don’t the Patriots tell opposing teams what plays they’re basically going to running before every snap from now on. It shouldn’t matter, because the opposing teams still have to make the plays. Which fails to address the possibility that opposing teams might have taken less risks when they had the ball if the Patriots’ offense hadn’t shown a near-miraculous ability to guess what their defenses were going to do (especially near the end of games, for some odd reason) or if the games weren’t as close as they were thanks to the Patriots’ unfair advantage. A stench that Belichick and the Patriots well-deserve. 1. Bill Belichick and the Patriots broke the rules. There is no disputing that. They were punished for it. 2. The question, however, is whether the severity of the punishment was equal to the benefit gained by cheating. How many teams wouldn’t give up a 1st round pick and $750K in fines for three SB titles? And why would Belichick risk getting caught at cheating unless he thought he needed that extra edge? 3. Automatically, critic ASSUMES that the stealing of signals ( which the taping wasn’t considered illegal until 2005, do the math ) correlates into automatic SB Wins. He disregards the seasons they didn’t win, and has disregarded the Patriots being 20-2 post spygate. Essentially, they have a better record since Spygate, and lost on the best play in football history. 1. The implication has been that the taping of signals is the golden lamp which when rubbed, automatically ensures victory. They insist that the advantage gained by these tapes is the single most important factor (even if some faint voices say otherwise) in the Patriots success this decade. 2. Strawman. I have yet to see anyone make anywhere close to such exaggerated assumptions. Automatically? No, only that it helps a great deal. Most important? No, but significant. 3. The critic falls on his own opinion by not only defying Bruce’s alleged hyping of automatically, but forgot he essentially said the cheating gave the Patriots 3 SBs in his first sentence. Hypocritical at least, fumbling idiot at best. 1. Never mind that the stealing of signals has been going on in all sports almost from the beginning. 2.Which ignores a significant detail: the Patriots were caught VIDEOTAPING (and not just “stealing”) signals. 3. Has not noticed that the rule was put into play in 2005, since videotaping was essentially hard to do since the required technology to do it well had yet to be harnessed. What if someone begins to telepathically steal signals? You have to put it in stealing signals category, since their are millions of ways to do it, and none of them, regardless of the efficiency, should be tolerated. 1.Nothing has changed since that day, in fact, the Patriots position has improved, as the notion of the walkthrough video has been dismissed. 2.While the last part of the sentence about the walkthrough is accurate, the rest is not, as it is now clear that Goodell greatly understated the duration and importance of the cheating during his SB presser. 3. Where is this information of the duration and importance? Does that mean the Patriots are just good forever because they stole signals. So when teams change their signals, which they do all the time, the Patriots have an advantage how? This is just a silly response. 1.What that quote is saying is that taping offensive signals in the past was irrelevant – because there are no hand signals to steal. 2.On the contrary, you’re confusing the verb tenses between present/future (”are” and “will be”) and past (”was”). Thus the quote stating that the new system will make hand signals irrelevant implies they were relevant before thereby contradicting your assertion. 3. Therefore the whole taping is irrelevant since they always change, regardless of signals. 1. They’ve behaved with the subtlty of a pack of screaming jackals. 3. I think you have a right to an opinion when a team is constantly berated by media with very little evidence. He even goes into detail into each person below. This editorial is meant to attack. That is like if someone tries to shoot someone, and you say ” He’s blatantly trying to shoot them!” Great analysis. 2. More ad hominem. Attempting to discredit the sources does nothing to refute what they claim. Otherwise, I could simply refute this entire article by stating that you haven’t even bothered to hide yours. 3. His agenda is to show that the media hyped the story. You can’t refute someone’s opinion, only the evidence from which it is based on. 1. Is it too much of a stretch to consider that Bishop wrote the article on Bledsoe’s wine and coffee business ventures as payola for the info in the Feb 22nd article? 3. He did go overboard here. 1. Schlereth has convienently not addressed the fact that the Broncos circumvented the salary cap so they could pay John Elway and Terrell Davis $29 million in deferred payments. 2. Tu toque argument. That the Broncos cheated has no bearing on whether the Patriots cheated. 3. He is trying to show relevance to another writer on a similar story. A 5-year old understands this. Trying to latin only makes it weirder. 2.Why? Because the Broncos did it instead of the Patriots? 3. No. Because the Salary Cap keeps you from hoarding great players. Hoarding great players and stealing signs are two different beasts, but I bet most people would rather Terrell Davis and Elway over the run & shoot schemes of Michael Vick. 1. Tomase’s story is the single most egregious part of this entire matter, and he has skated, scot-free. 2. I agree that he deserves more than a slap on the wrist for writing an unsubstantiated story, but then again, so does Belichick for cheating. 3. Again. Belichick gets fined and loses picks and he deserves more from someone who has never played the sport and understood the importance of the event. The difference is, Tomase made a lie and didn’t get punished. Belichick did. The punishment fit the crime, which he is proving it is overblown in the article. 2.Poisoning the well. Besides, it couldn’t have anything to do with Belichick cheating and basically getting away with it, could it? 3. And he put his argument there already by talking about the other coaches. Did you read this article? 1. Can you sit there and realistically say that had it been Tony Dungy, Jon Gruden or Herman Edwards that did this that the stories and commentary would be as nasty and personal? 3. That is what Tomase did, and that is what Bruce is doing. It is an editorial. Editorial’s passion are based on speculation. 1. Regardless of perceived advantage that the filmed signals would’ve provided, the players on the field had to make plays in order for the Patriots to win their championships. 2.Yet cheating makes it easier for them to be in the right position to make those plays. If you disagree, then I suggest a little experiment: why don’t the Patriots tell opposing teams what plays they’re basically going to running before every snap from now on. It shouldn’t matter, because the opposing teams still have to make the plays. 3. You still have to prove if it helped them. If they were losing, I understand. But 20-2, I’ll take that over cheating any day. 1. Knowing the defensive signals didn’t help Ty Law pick off Peyton Manning in the playoffs. It didn’t help Rodney Harrison seal the Super Bowl against Specter’s Eagles with a pick. 2.Which fails to address the possibility that opposing teams might have taken less risks when they had the ball if the Patriots’ offense hadn’t shown a near-miraculous ability to guess what their defenses were going to do (especially near the end of games, for some odd reason) or if the games weren’t as close as they were thanks to the Patriots’ unfair advantage. 3. And in 2007, top 5 defense in the league? They had no clue, and they still won. 1. Whatever the reason, the stench from all of this mess is going to take a long time to wear off. 2.A stench that Belichick and the Patriots well-deserve. 3. Well, they’re 3-1, and a miracle beat them. Try to beat us post-spygate. Come back and take your medicine, Deof. You just got owned again.